I just attended the Second Annual Smart Kitchen Summit (SKS) in Seattle. I’ve lived the last 30 years in Microsoft territory, which is now becoming the new Silicon Valley, and I even worked there for a number of years before studying to become an Interior Designer specializing in the Kitchen and Bath field. I’m completely a tech geek! 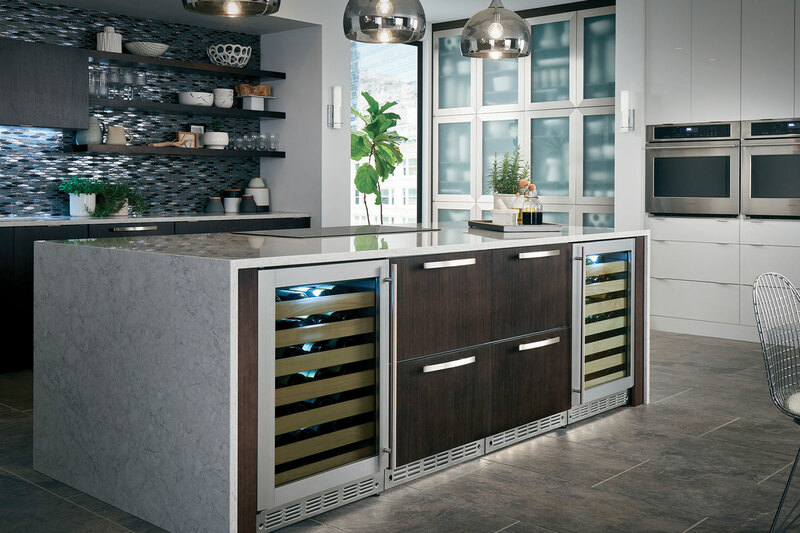 After being in this industry for nearly 20 years, I am a little “Over” what today or tomorrow’s Kitchen Trends are, and I am so much more excited about where we’re going in 10-20 years! I long for the Jetsons’ kitchen! I long for ease and convenience, and for an integrated, seamless, fluid experience that even now in my head I imagine will be intuitive and feel like it’s always been there. I also grew up on SciFi and love the idea that Star Trek’s handheld voice communicators, lapel pins, were the first cell phones and wearable communication devices. I personally can’t wait for drive assist or self-driving cars! What does a Smart Kitchen mean? Is it merely connected, wireless devices connected to our appliances and apps telling us how to cook or order more paper towels? It should aid our lives in health, time savings, safety, environment, social/community, and it should be a source of energy conservation . . . OUR energy conservation. It should allow us more time with family and creative endeavors, time for a more meaningful life. What it should NOT be is tech for the sake of tech, one more thing to be maintained, one more thing to learn, five apps to make dinner . . . NOPE! Give me old school or give me intuitive interfacing! Health information for dietary restrictions, Diabetes, Gluten, expiration dates, etc. Imagine a day that the government mandates that a dishwasher use ½ as much water. How will the industry adjust to maintain function with less? It’s easy to immediately jump to the large built-in appliance category for this, but just last year I discovered the Lenova Faucet AquaLogic that featured a method for reducing germs in the kitchen! And “something old becomes new again” so much technology that restaurants have used for years are beginning to trickle down into our homes and kitchens. It’s not new, it’s just new to the average homeowner, like Sous Vide and Flash Freeze. Or going from years of dishwashers only having 20 +/- jets to 140! And what a concept . . . an initial steam cycle to loosen the dried-on food so the main wash cycle can be more efficient, which now seems like a no brainer. It’s not all Silicon Valley’s responsibility to dream up the Smart Kitchen! It’s just about the millions of ways we can make this space more efficient. Someday there will be another technology other than the microwave. Johnny Grey spoke this year at the Smart Kitchen Summit, he and I were sadly the only residential kitchen and bath designers in attendance this year. Something I will be partnering with SKS to change next year. His belief is that people want “emotional experiences” not things. In the kitchen space we are a “conductor” and this is an “orchestrated space.” As he says, “The kitchen is a public good – society depends on effective families.” The question to all of us to keep in mind is … how does a Smart Kitchen or a Smart Home help support an effective healthy family? “What is the most natural UI for the kitchen? Voice,” said the Amazon Alexa Director. I later asked when the Echo will just be a wearable device, or run on any wearable device. The look I got told me all I needed to know! Speaking to the Seattle NKBA Chapter Mick De Giulio said, “Today’s kitchens are not about individual elements but about the Whole space.” As we start educating ourselves about our homes and our clients’ homes, we need to take a step back and remember the big picture before getting all excited about the individual cool features being marketed. And, does IoT (internet of things) really mean Integration of Things? I like that perspective. I read that idea in a Tech article, which interestingly I read way more of than design articles these days. At the 2016 Smart Kitchen Summit, Michael Wolf talked about the Kitchen Operating System. We got to see everything from a prototype 3D food printer, a countertop smart juicer, smart glass bowls replacing your Tupperware, to Sous Vide attachments, fresh spice, and home-growing hydroponic systems. I got to talk to the owner of Allrecipes.com, based right here in Seattle, got to meet a Chef who used to cook for Oprah, the Amazon Alexa director, CEO’s of major high end appliances, the woman who runs the Campbell Soup Test Kitchen, HGTV, Good Housekeeping, Serious Eats, Williams Sonoma, CNET, Reviewed.com, Association of Home Appliance Manufacturers (AHAM), inventors, start-up company owners, techies everywhere, retail outlets, media and venture capitalists . . . All under the same roof. I was giddy as a geeky school girl. I can’t wait to recruit more of my peers in the Residential Design/Build industry to attend, especially if you capitalize in designing kitchens of the future!